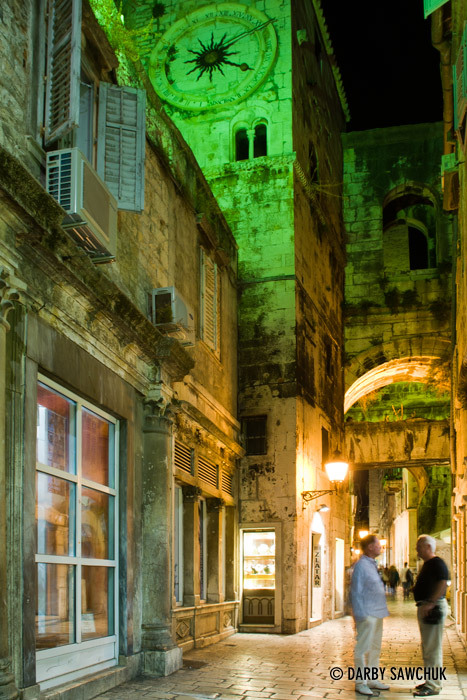 A couple of men enjoy a warm September evening in the narrow alleys of Diocletian’s Palace in Split Croatia. 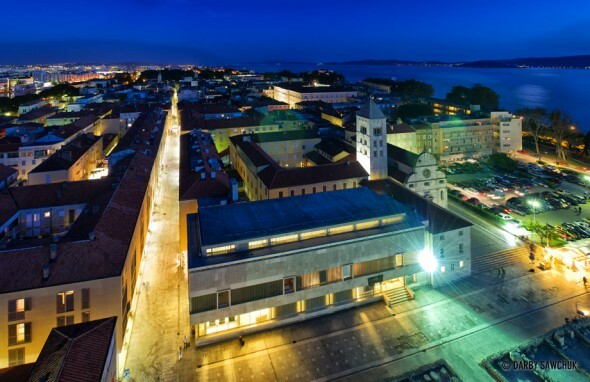 After Zadar’s legendary sunset had finished on my all-too-short day there, I hustled up the steps of the bell tower of St. Anastasia Cathedral to catch the blue dusk descending on the the twinkling lights of the city. I managed to precariously perch a tripod on top of the tall parapet at the top to keep the camera steady and got decent results from my tiptoes. 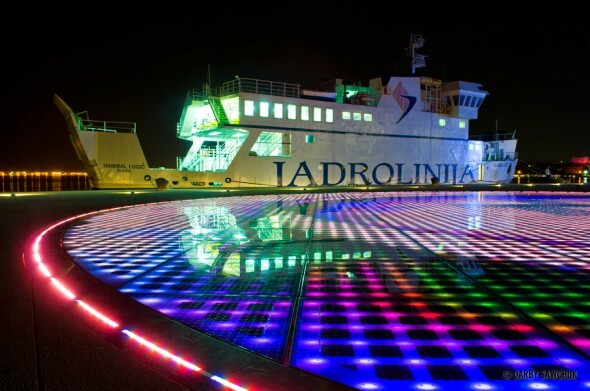 The shot from a while ago of the folks relaxing next to the sea organ in Zadar is complimented by this one of the Greeting to the Sun, an art project/giant outdoor disco floor created by architect Nikola Basic. This clever circle of solar panels captures the brilliant light of Zadar’s endlessly sunny days and stores the energy until night when it can release it in the form of an impressive, underfoot, ever-changing rainbow of lights. The panels also accumulate enough energy during the day to help power the lights along the boardwalk (no disco lights there though). Today’s photo of the day comes from Croatia’s cosmopolitan capital, Zagreb. 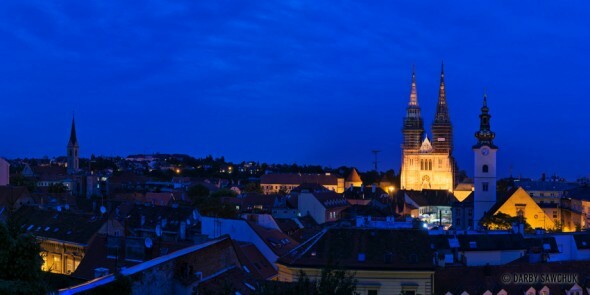 The spires of Zagreb Cathedral poke themselves into the dusky, blue evening sky. This isn’t just your average seaside relaxation spot. 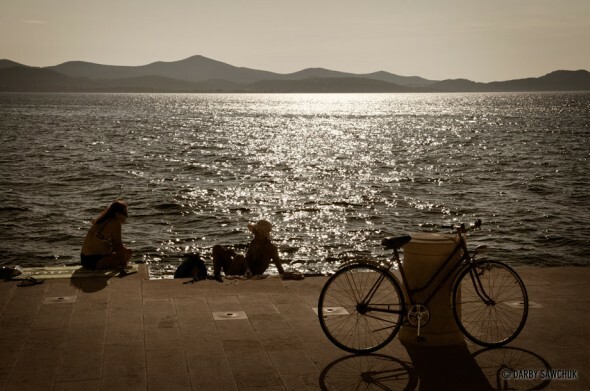 Here in Zadar, Croatia, these folks are chilling out and not just enjoying the sounds of the waves lapping against the chore, they are also appreciating the unique music of the sea organ. You see those small holes in the boardwalk? They lead down to the water where waves push air up to create random, entrancing harmonies. 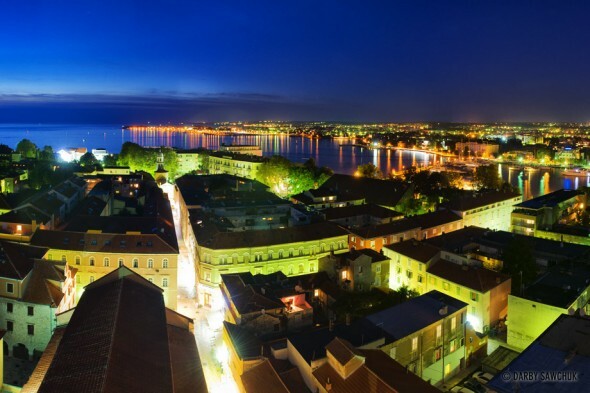 The sea organ is the creation of architect Nikola Basic along with the nearby Greeting to the Sun installation (a series of solar panels that release their energy in a hypnotic light show in the evening). Together, they make for a magical little stretch of coastline. 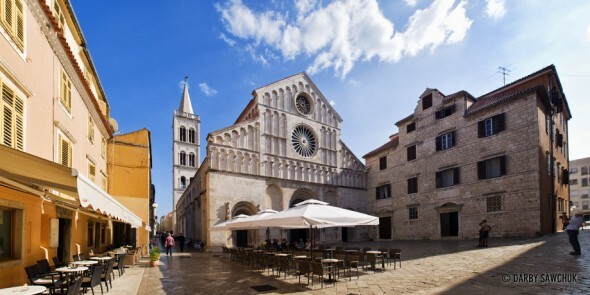 Moving away from the Croatia’s Plitvice Lakes, Zadar is one of the must-stop cities on the way down Croatia’s coast and one of the building’s to admire there is the over-1000-year-old, pre Romanesque Church of St. Donatus. 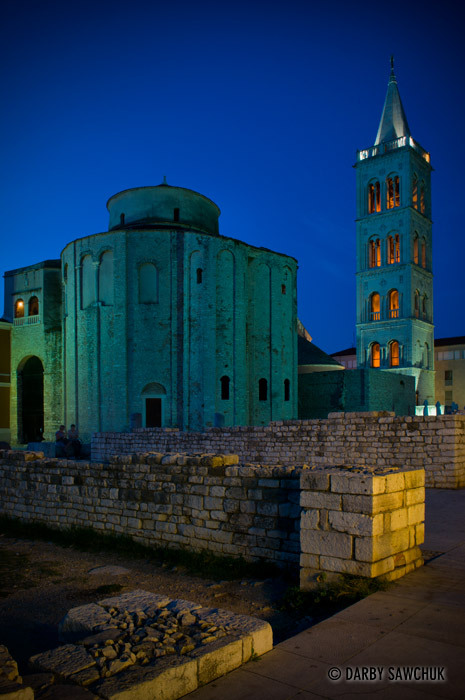 Here it is in the evening, flanked by the tower of the nearby Cathedral of St. Anastasia. Okay, I know, I know. 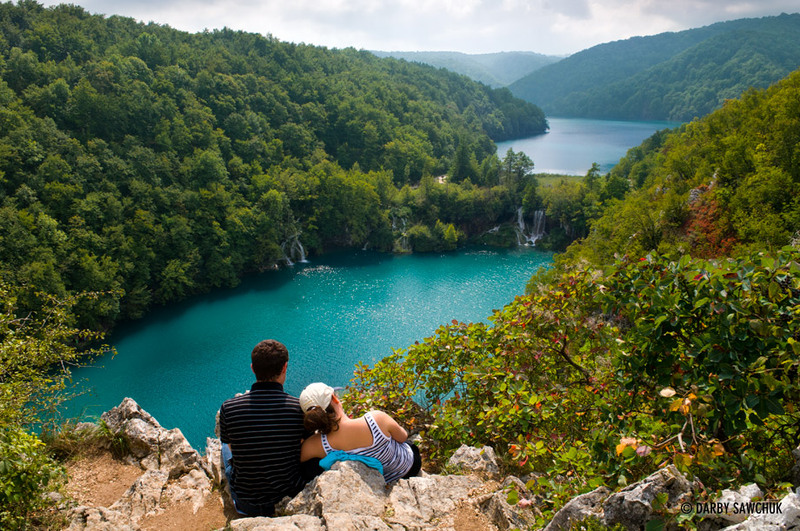 There’s some waterfalls visible in this shot of a happy couple enjoying the sun and sights of the Plitvice Lakes. I forgot those little cascades were visible down there. I didn’t lie, I just kind of messed up the truth. I hope you can forgive me. Let’s just forget it ever happened and imagine we are sitting on that perch up there and feeling as content and blissful as that couple must have been feeling at that moment. As promised, here’s the last of the waterfall shots from the Plitvice Lakes. I hope you’re not sick of Plitvice’s waterfalls yet. I have one more after this to post and then, no more for a while. I promise. 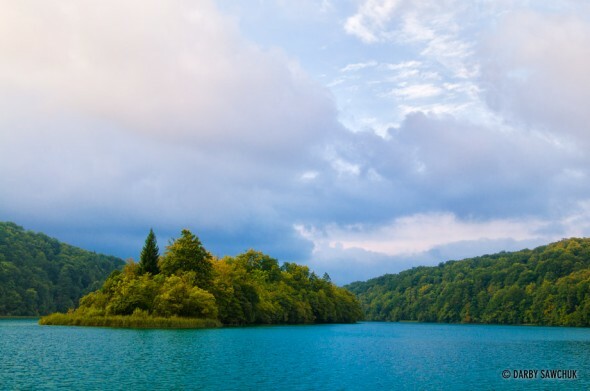 The azure waters of the Plitvice Lakes vary their colour depending on the time of day and the weather, but you don’t have to try too hard to see a brilliant blue like this one on Kozjak, the largest of the lakes. 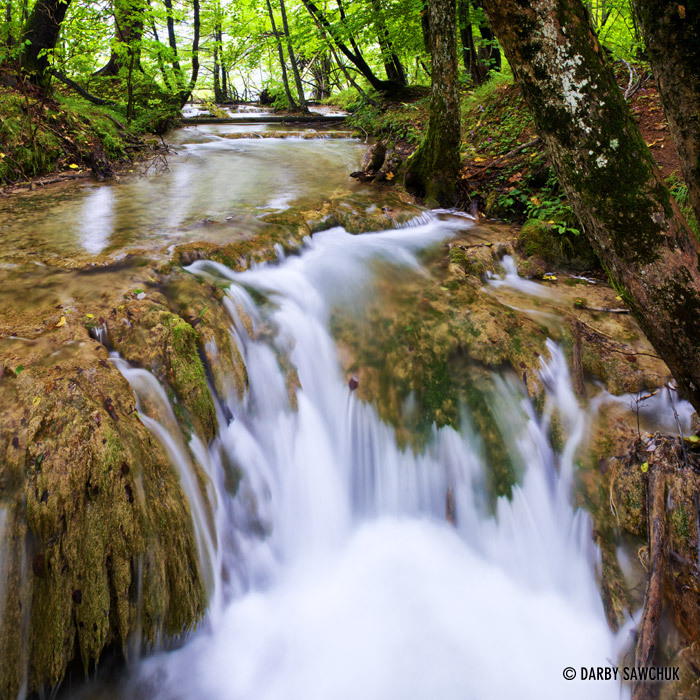 This was one of the first shots I took in Croatia’s Plitvice Lakes National Park. It was a good indication of all the magnificent sights to be seen in this area. 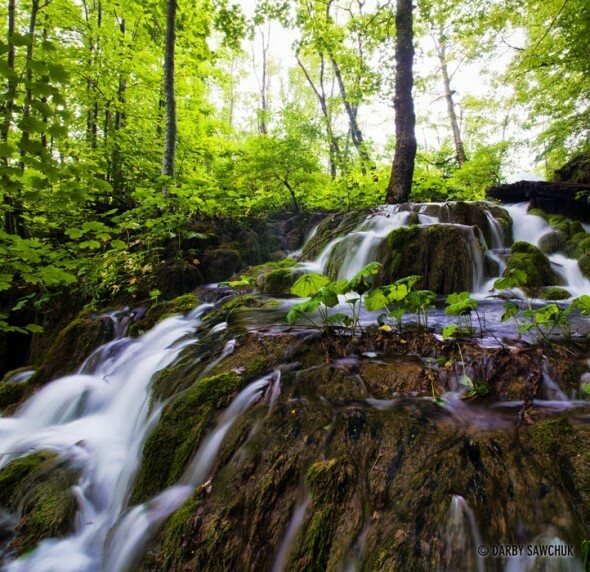 Located at the upper lakes, this little cascade went directly underneath the walkway I was standing on to get this shot. We finished 2010 with plenty of shots from Croatia’s wondrous Plitvice National Park and I have another batch of lovely waterfalls to share, so let’s get on with it. And now that you’re feeling nice and chilled out, I hope that feeling carries on for you through the holiday season. Merry Christmas and happy new year everyone! 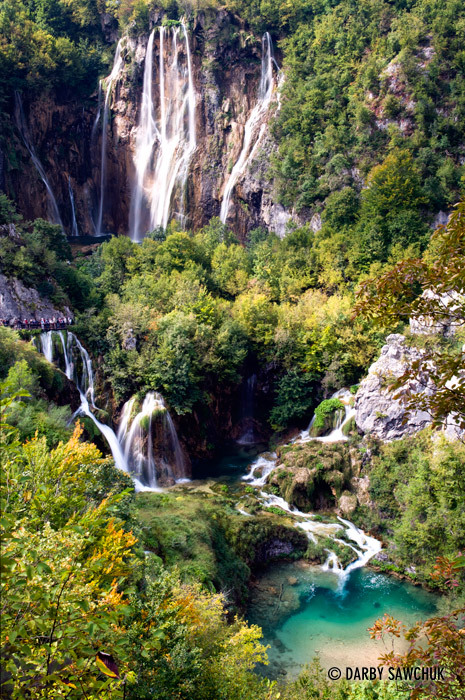 As I mentioned in the previous post, here’s a pulled-back shot of Veliki Slap, the big waterfall in the Plitvice Lakes, Croatia. In this one, you can see the tiny little people on the left-hand side of the image and that should let you know just how huge the waterfall is. 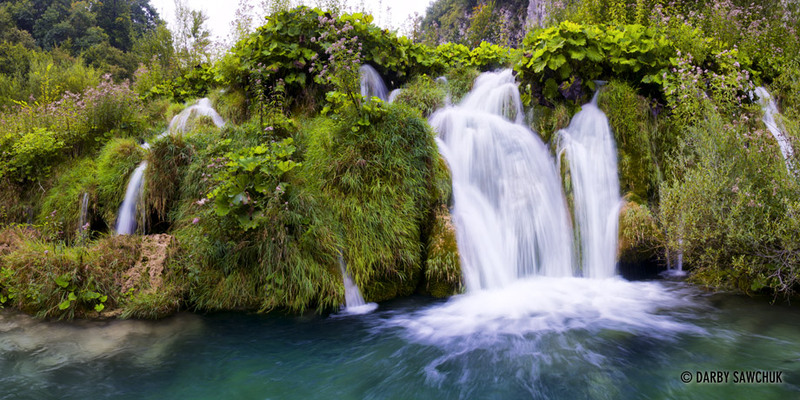 Veliki Slap is is not just the largest in the Plitvice Lakes, it’s the largest in Croatia – 78 metres of frothing fun. I did have to stitch together a number of images to get this vista thanks to its height. I’ll admit that this photo suffers a little from a lack of scale. It needs a tiny little human at the bottom to show just how big it really is, but one is allowed any closer than the point at which I was standing. That’s for the best really. The park has done a great job of keeping the area pristine and I would hate to have to make exceptions just for little ol’ me. Wait for the next photo of the day to see what I mean. In it, I’ve pulled back (a lot!) to show just how huge the waterfall really is. 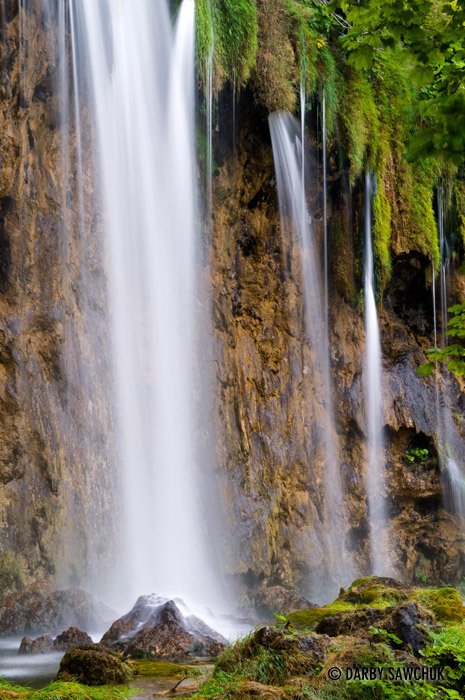 One of the challenges of photographing the waterfalls of Plitvice is that you have to take most of your shots from the wooden walkways throughout the park. Unfortunately, they weren’t designed with photographers in mind. How rude! The problem is just that the walkways are rather shaky. It doesn’t matter how stable your tripod is, when anyone moves, your camera moves. Even when someone is a good 50 feet away, you may feel their vibrations disturbing your camera’s equilibrium. That just means that patience is the order of the day. The only problem with that, however, is that these walkways are sometimes a bit narrow and you might have a few impatient tourists queueing up behind you if you’re not paying attention to your personal space. So, you have to be both patient and considerate. You should be anyways, but consider this a reminder to everyone out there. It is Christmas after all and you don’t want to end up on the naughty list. This shot was a good example of the above. Narrow walkway? Check. Busy area? Check (two paths converged nearby). Also this one also has a path in the shot, (upper right), so I had to wait for the path to clear in the shot as well as for the vibrations to cease. But like I said, a little patience and we’re done. 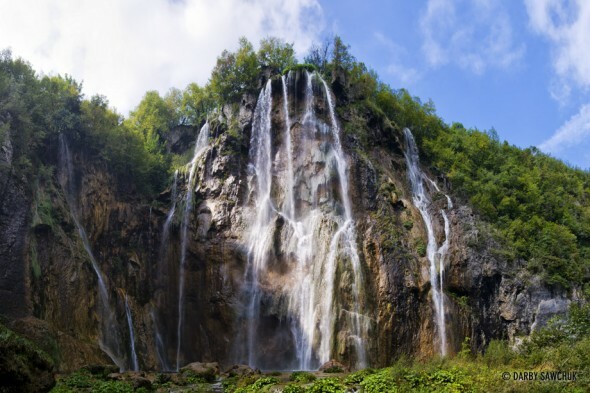 This shot of some of the lower falls in Croatia’s Plitvice Lakes National Park gives a sense of place and scale to the walkways and paths a visitor gets to walk. How I wish I was one of those little people down there right now. When checking into the hotel there, the lovely clerk who helped us, told us to come back after we had explored a little bit of the lakes and then tell us for how long we would like to extend our stay. Her confidence was not misplaced – we booked an extra night as soon as we got back. She knew very well just how seductive the park could be. 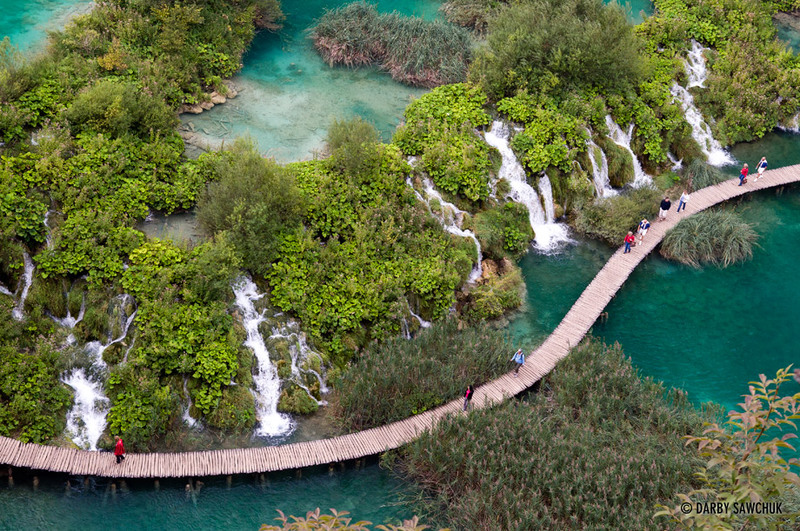 Today’s image shows you just what it’s like to walk on top of a waterfall at the Plitvice Lakes National Park in Croatia. As I mentioned in the previous post, these walkways are well-integrated into the landscape and keep you close to the most interesting sites in the area. I have a feeling these paths might sometimes be tricky if the seasons decide they want to flood or freeze the area. In places, portions of the walkways were sometimes a bit damp from encroaching water. In the midst of a spring thaw, I imagine the water must get quite a lot higher than what I witnessed. Winter must also make walking on the paths into an adventure, but the sight of a host of frozen waterfalls probably makes you quickly forget about that slip that landed you on your behind. I visited in the tail end of the summer and the green trees beautifully complimented the azure waters of the lakes. A hint of autumn colour was starting to shine through and it must have been a pretty spectacular sight a few weeks later. So, I guess what I’m saying is that it’s probably a fun spot to visit any time of the year! 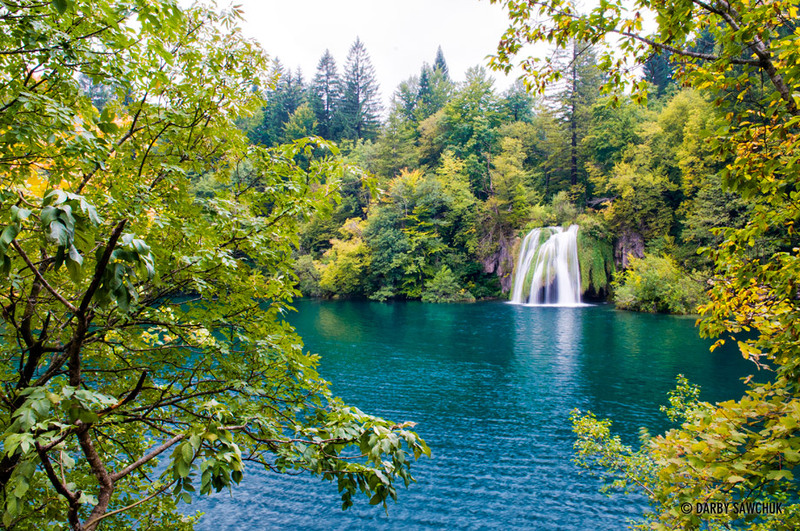 For the next little while, the photos of the day are going to be from one of my favourite places in Croatia: the Plitvice Lakes. 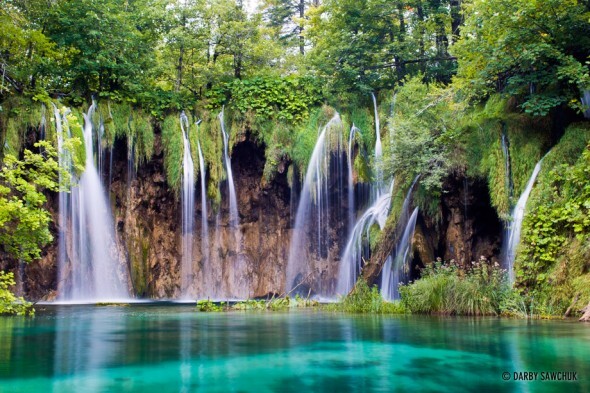 I think I mentioned before that if there is a heaven, there’s a little slice of it that looks like Plitvice. As the water flows through the area’s mountains it picks up minerals that coalesce to form barriers between the ever-changing lakes. These natural dams force the water from the lakes to leap down from one step to another in gorgeous cascades. The result is a landscape photographer’s dream (except for the tour groups). 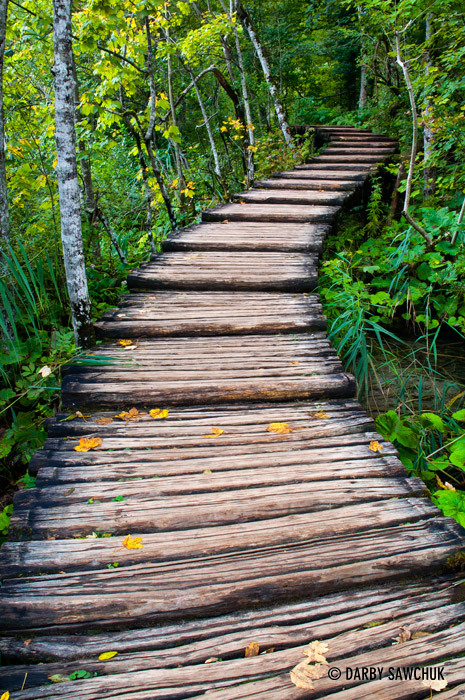 Wooden walkways have been sensitively integrated into the natural surroundings and keep visitors from trampling the place into oblivion. 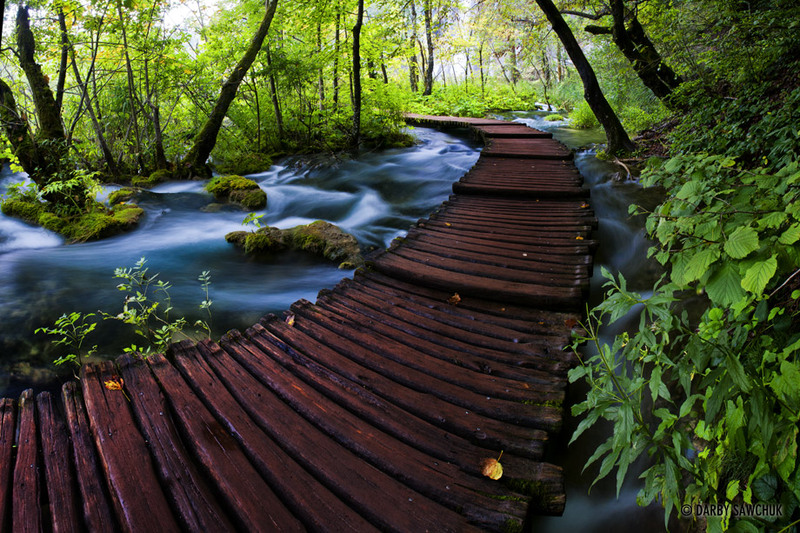 It’s not a place where you get to do a ton of wandering off course, but the best bits are near the paths anyway. 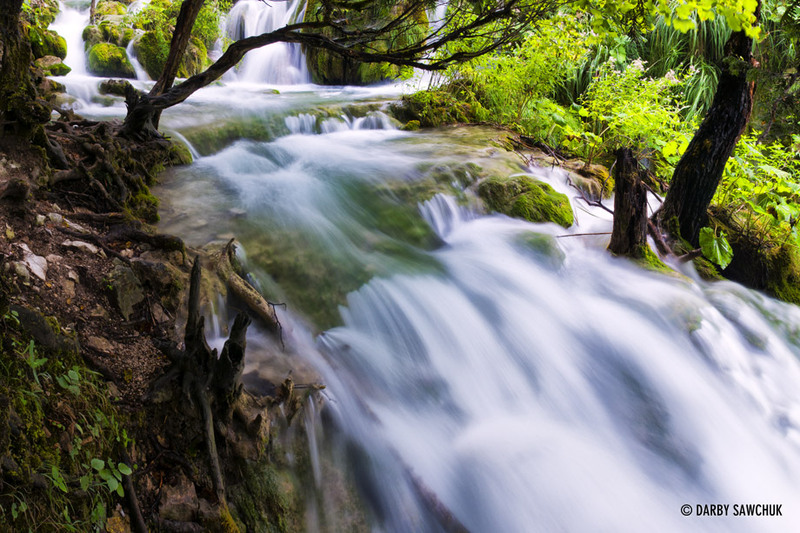 This first shot is one of the first big waterfalls that you will see when you visit the upper lakes. I don’t think I’ll ever cease to be blown away by 2000-year-old structures, ruined or otherwise. 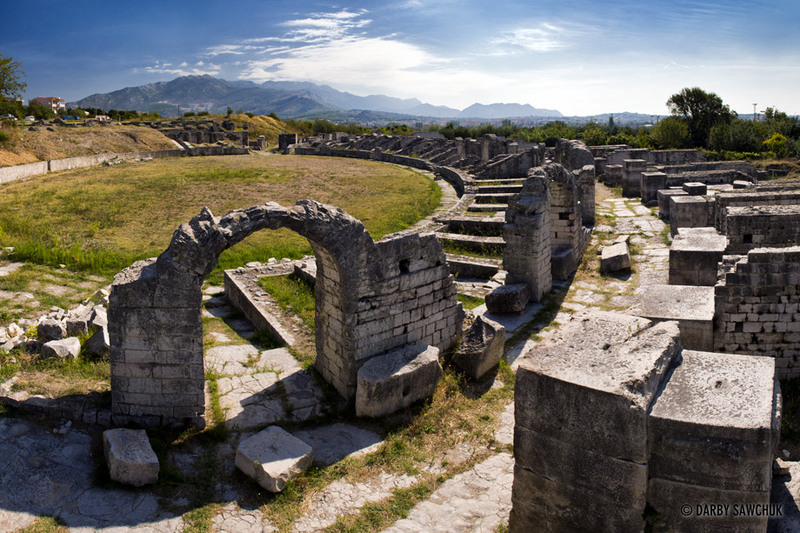 The ruins of the Roman city of Solin near Split Croatia don’t disappoint. Okay, so it’s not quite 2000 years old, but it doesn’t matter to me. The fact that these structures are still here for us to admire centuries later is such a joy. This amphitheatre is one of the better sights and it inspires your imagination to wonder what it would have looked like in its heyday. 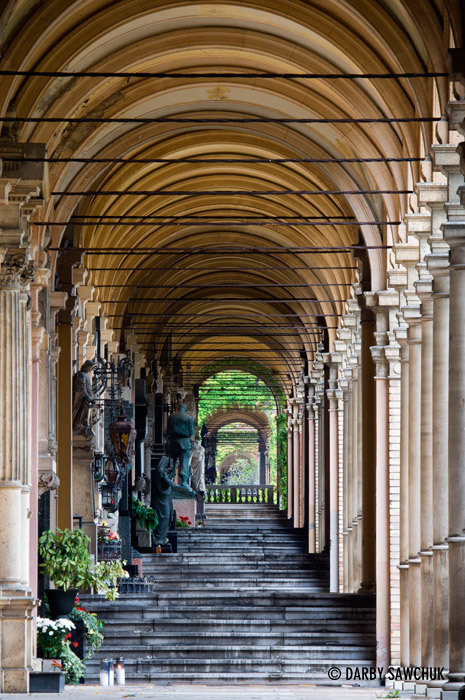 I believe the Lonely Planet described Zagreb’s Mirogoj Cemetery as one of the most beautiful in Europe. Who am I to disagree with their assessment? The most unique feature of this peaceful place is the lengthy arcade that stretches across the cemetery and shelters the tombs and monuments from the elements. I visited on a drizzly day and these arches kept me dry while I admired the solemn beauty of the cemetery.